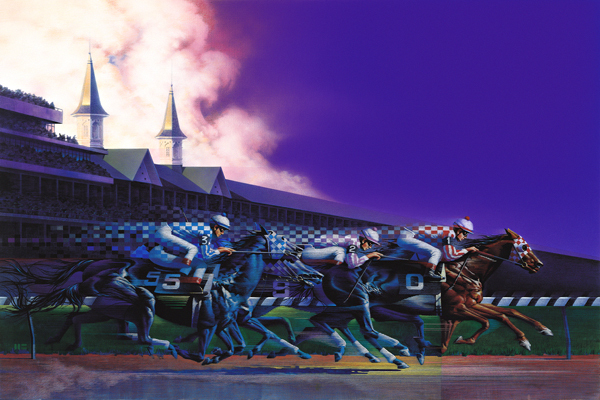 Win Place Show illustrates the cycle of a horse galloping toward the finish line during The Kentucky Derby at Churchill Downs. Four jockies, four horses and twenty-one legs were used to create a merry-go-round of motion, where the horse is airborn between each rythmic stride of its pounding hooves. This is an up-scale print and a wonderful gift for pony fanatics. The original 3'X2' painting was created on triple-primed linen canvas using graphite pencil under-drawing, acrylic paint and colored pencil.The print is limited to 400 signed and 20 artist proofs.